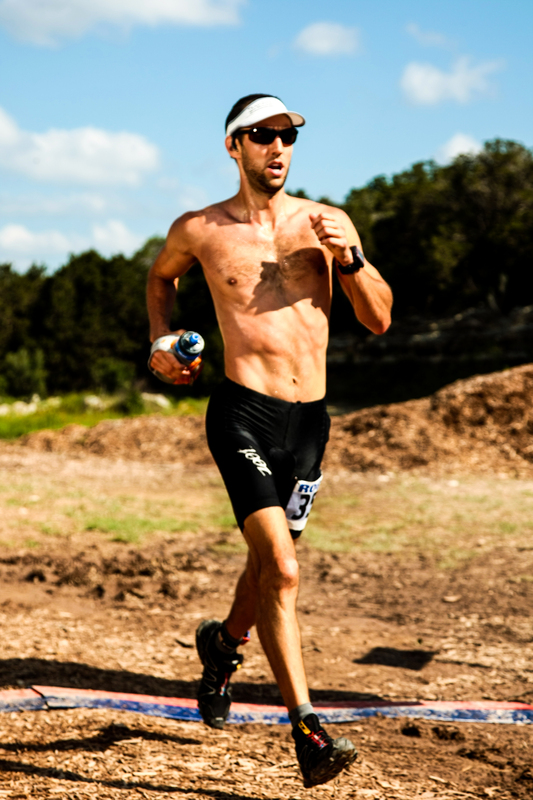 Back in 2009 I had a near-complete collapse in this race, dazed and dehydrated and experiencing one of my ugliest running experiences ever, along with perhaps my worst relative finishing position in any trail race to date. Last year I made up for it a bit, running much more to my fitness level and enjoying the race in the process. This year, however, things came together from the start. It was a good day on the trail. Despite the two marathons and a 50-mile race in the 4 weeks leading up to this 30k, I felt rested and ready from overall lighter total weekly mileage. It was nice to sleep at home the night before, with the race being only a few miles from the house. Pretty much everything went the way it was supposed to – I came in motivated, the weather was mild (for May in Texas, anyway), no cramping, no falls, no getting off course, and fairly even splits over the three 10k loops. 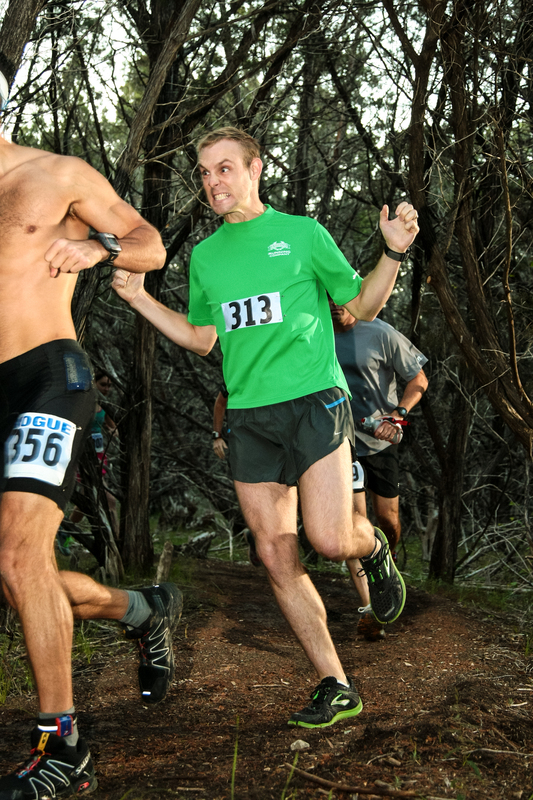 As with races under a marathon, I knew that my place in the field wouldn’t be great. I let the speedy folks get away without stressing about it. I held back early, not allowing myself to surge on the flats or push the uphills. The course has quite a few very short but steep ups and downs and tons of loose rock but there are some nice stretches of winding, tight, wooded single track, which is my favorite terrain. I did my best not to fall too far into no-man’s land so I put in just enough effort to catch whichever runner or two were within reasonable distance. Both for confidence and conversation, as well as a bit of insurance that I’d stay on course, I made sure to stick with a rotation of guys who settled into similar paces. (Ben Phenix, if you happen to read this, thanks for the chat and keep up the impressive running.) The front 10 or so were a lost cause for me but the next 10 spots seemed up in the air.I came through the first 10k loop in 57:42, a bit quicker than intended but close to the hour I figured it would take. That second loop took 59:19, total elapsed time 1:57:01, meaning that with the final 10k loop I knew my 30k PR (2:59:43) was definitely within reach, and on a tougher course than where I had previously set it. With the temperature rising and 6.2 miles of rocks to still fall on, I tried to just run evenly. The entire race I ran without looking at any GPS watch data – no pace or distance or splits or even elapsed time. This was a first for me and I think it was smart. I didn’t stress about my pace falling, I just focused on the trail immediately ahead of me, listed to my music (Kenny Rogers is fun to run fast to), and went as quickly as I could without hurting myself. Then, a break in the action. 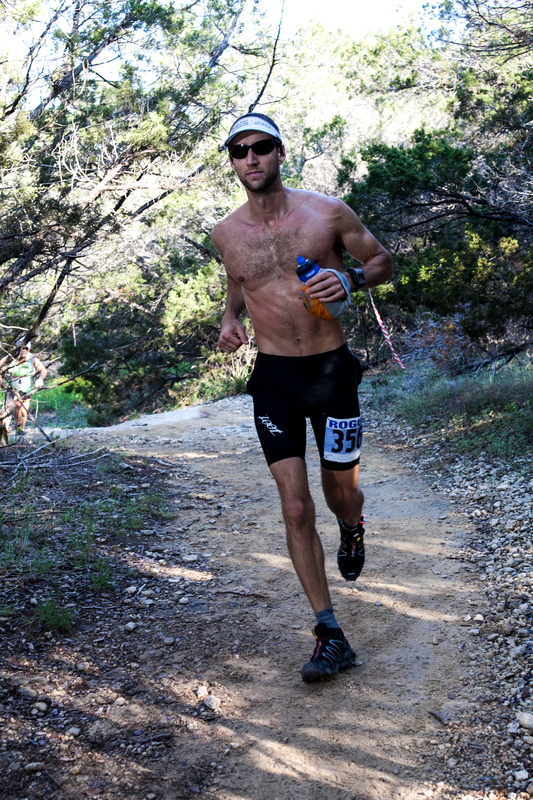 After getting passed by 3 runners in the final loop I sped up over the last few miles to give everything I had left. I’m guessing my miles 16 and 17 were some of my fastest of the day. But, with less than a mile left, I came to a dead stop when the trail ahead of me was blocked by a downed, bloody runner, who was being helped by my speedier buddy Andres. The hurt runner was a mess – Andres had come across her stumbling around and incoherent, already bloody from a fall that included her face hitting the ground. There was little I could do do help – I had neither the expertise nor materials to make the situation any better. So, after maybe 2-3 minutes of coordinating phone numbers with a fellow bystander so I could get Andres’ medical bag back to the scene, I used a final burst of energy to sprint to the finish. Loop 3, even with the delay, took me just 60:51, for a final finishing time of 2:57:52, good for a PR and 15th place overall. Granted, there were at least 2 people who should have finished ahead of me – Andres and the fallen runner – but I was racing for time more than position and I was happy to cover the distance about 4 minutes faster than last year on the same course. Immediately after the finish, through the frenzy of trying to re-locate the hurt runner and get Andres his pack, I ended up taking Andres’ car to double-back on the road running parallel to the course, hopped back on the trail, walk-jogging to get back to the scene. Not easy, as it was getting warm, I hadn’t caught a breath at the end of the race, and I was now carrying the pack, not knowing which direction they were. I heard they may have started back on foot to the start area so I drove back to the start line, meeting them and a mess of additional paramedics and firefighters. No word on the girl, who I hope isn’t too beaten up. Andres guessed that she had pushed too hard and passed out, falling and breaking her nose and who knows what else. He did what he could, and she was taken off by ambulance. I’ve seen Andres in action before but it was really cool to see him running point, with at least 4 others taking notes and following his directions. In the middle of the woods, after at least 18 miles of hard running. It definitely sucked for him to essentially forfeit his race (he’d have been top 8 overall) but I think the folks from the event – runners and staff, to sauy nothing of the girl – were more impressed by his help than where he’d have placed. Now, I’m on the road to the Cactus Road 100. Seriously. No more screwing around. I’m going to take things week to week, with a generally loose training structure. 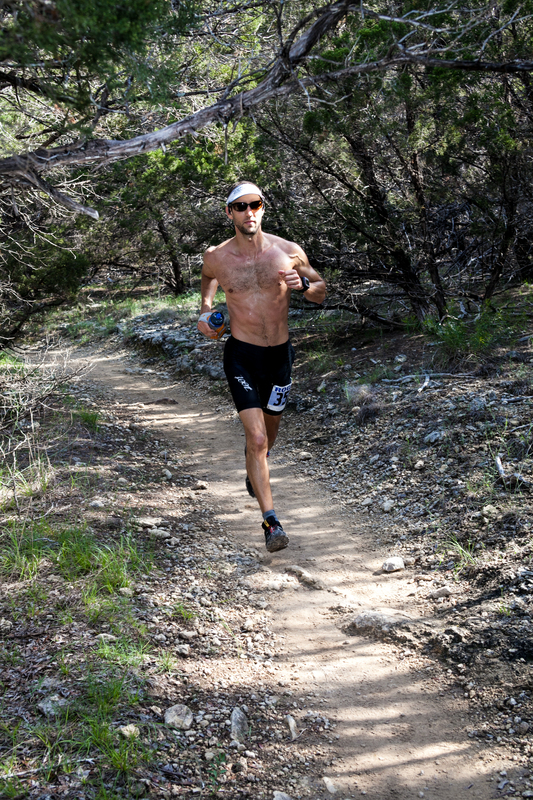 First and foremost, I want to get in lots of miles on trail. For the next month or two it will be a build up with the idea of getting in 60-80 mile weeks. I don’t plan on including much top-end intensity but expect to get solid work on hill repeats and maybe some tempo runs. I don’t expect to do much running at all under 7:00min/mile but that may change when out of Austin this summer. Maybe some back-to-back long runs starting soon, probably 2-a-days at least once or twice a week. Time to go get it. The digression was pretty sweet.